It’s a busy card but I do like the way it turned out. It’s bright and fun. I will be doing a workshop (I know, gasp for the girl who NEVER does them) next weekend, so I’ll be giving this to the hostess (who is my old upline). CARDSTOCK USED: Chocolate Chip, Old Olive, Whisper White, Textured More Mustard, Soft Sky Prints DSP, East Coast Prep DSP. INKS USED: Chocolate Chip, Old Olive, More Mustard, Soft Sky, Real Red. ACCESSORIES USED: Bold Brights & Earth Elements Colored Brads, Real Red Striped Grosgrain Ribbon, Ticket Corner Punch, Horizontal Slot Punch, Paper-piercing tool and template. 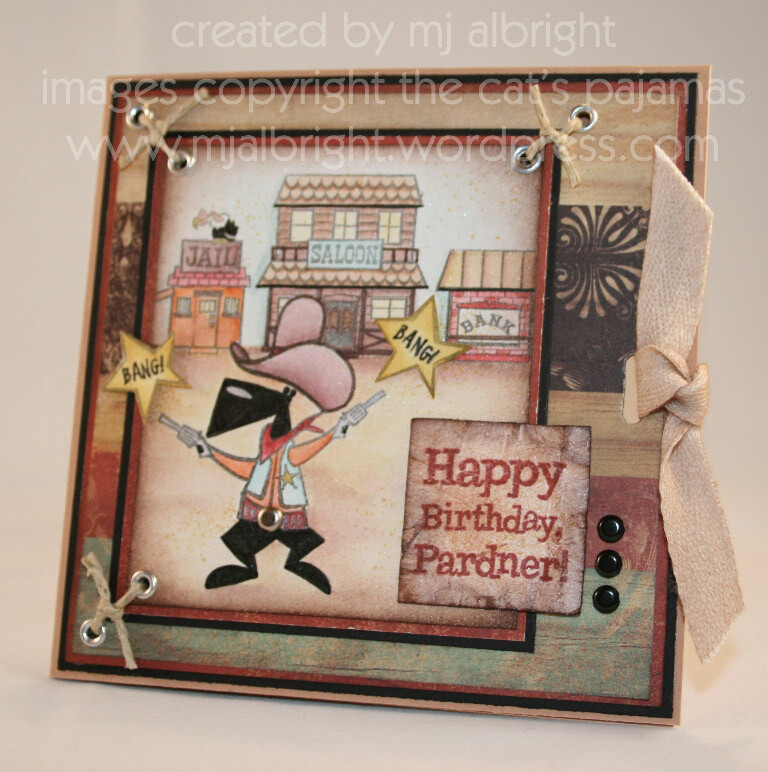 Part 2 features a Hanging Treat Box to coordinate with the card I made for Beate’s wsc#36. You can find the tutorial here from SCS. Like mentioned, this is for my little neighbor next door who’s turning the big 3 soon. Hmmm, what to put in the hanging treat box?? An 8 count crayon box fits perfectly. 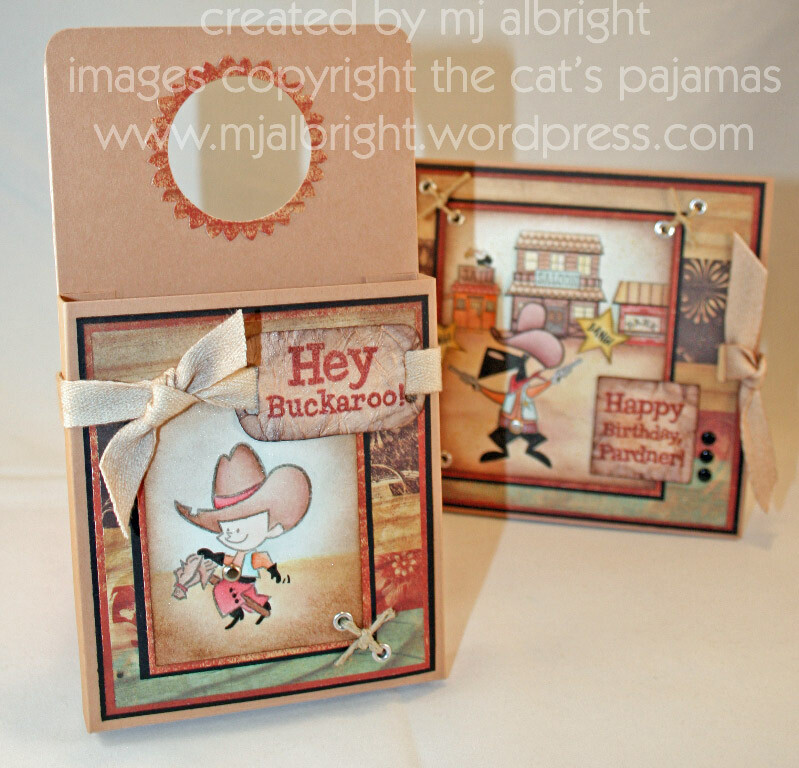 I used The Cat’s Pajamas stamp set Havin’ a Pow Wow for this one. So cute for a little boy. This is one of those creations that I will want to grab back off of the person after they receive it 🙂 I just like them so much. Wow! It’s Friday already. I’m happy that this week is coming to an end, and I look forward to being snowed in with my family this weekend. 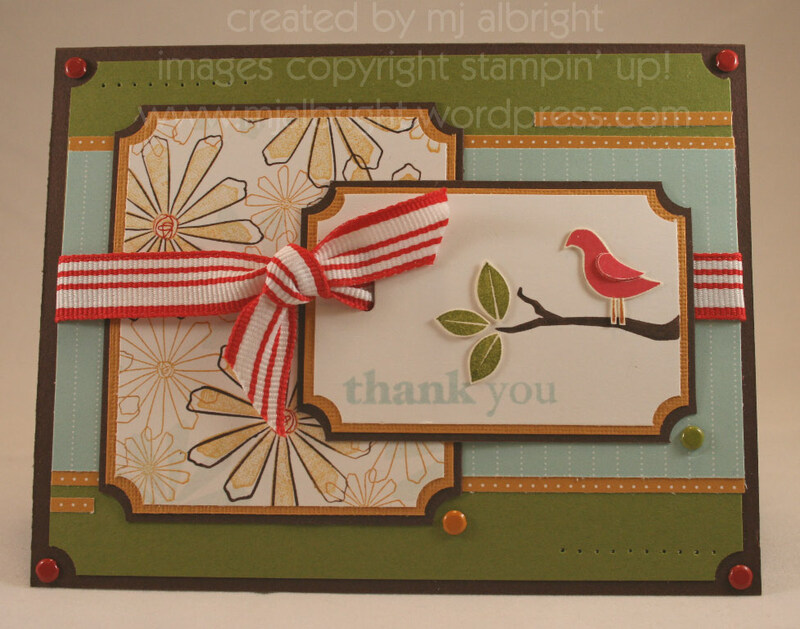 It is snowing here and it should turn to freezing rain shortly…..stay home and catch up on some stamping right? While at CHA, I got to spend some time chatting with Alma from The Cat’s Pajamas. She is so sweet…everyone I met was sweet!!! I decided to use one of her sets today. This card is made using It’s A Western Thing. How cute! My neighbors son is turning 3 years old in the beginning of March. Our children play together often so this card is for him. Thanks for all the get well wishes that have been left for me. I pray you avoid getting whatever it is that is going around. I haven’t spent this much time in bed since my teen years. And the dizziness…uggghhh! I’m still nauseated, have no appetite, and things just taste different. Oh, and can’t forget the hacking cough. How sweet is Charmaine Ikach? VERY. I received this card earlier in the week and it really brightened my flu-recovering day. 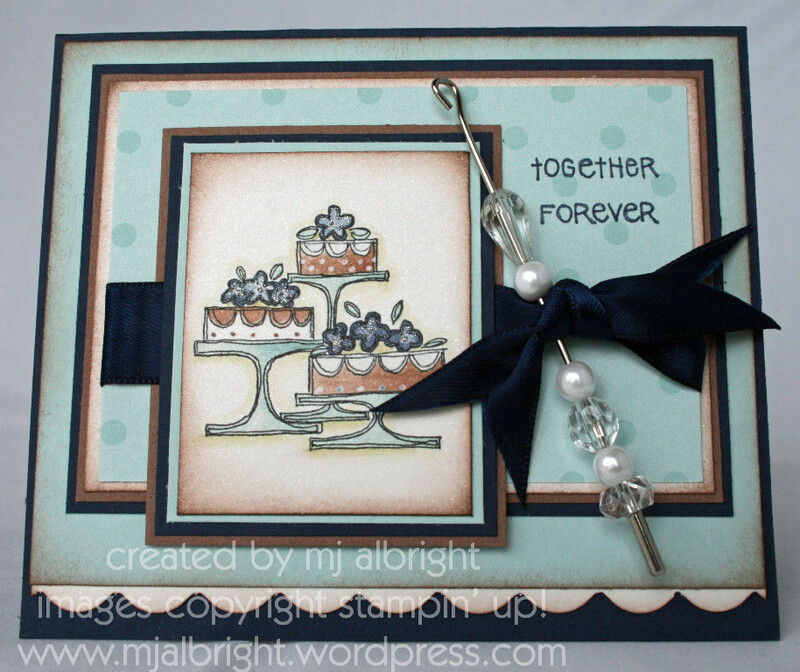 Make sure to head on over to Charmaine’s blog to see some more of her beautiful creations. I feel almost 100% better and will return to blogging in the near future. My whole family has the flu. I can talk about it now since I have it…I guess you can say I’m one of those “knock on wood” kinda persons who doesn’t talk about things due to fears of having it happen. This is only the second time in my life having this nasty flu-stuff, with the last time being about 20 years ago (yes, I remember the incident vividly). I got several emails regarding these cute baby onesie cards that you can view here. Lauren Meader posted the tutorial on her blog for you all to view and play around with. Please take the time to read her post and case away for your own personal use like I did.